Well, grades are in, but as we all know, that isn’t necessarily the end of the story, so I brace myself for those who are unhappy. One student has already complained about a grade before the final grades were entered, so the odds are good that there will end up being some kind of dispute. So it goes. 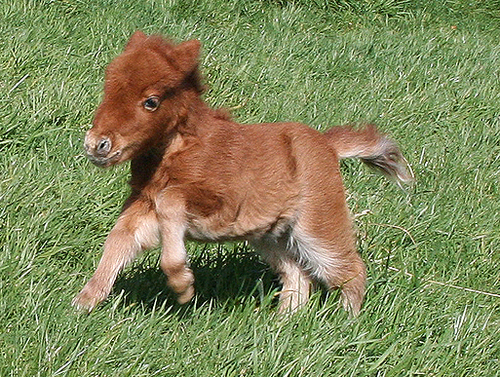 Hey, here’s a cute baby horse picture thanks to Cute Overload (AKA something to cheer the blackest heart). I feel better now. Don’t you? I shall force myself to feel some relief, too. Endpoints and beginnings are important to note. I had lunch with a very smart graduating senior who cheered me immensely, and it is Tuesday, which means a beer at Mahar’s with the History and Political Science folks. Tonight we sign the lease on our new apartment, too, so that’s good. Tomorrow morning it’s off to Kalamazoo. I’ll join Faye and Miss Wendy in Detroit, and then the three Furies will drive across the state to the big medieval geek fest. The rest of the summer will be devoted to avoiding semi-colons.